What is it, that uniquely identifies a Latvian? For a country where the notion of a Latvian consciousness didn’t appear until the later stages of the nineteenth century, there is certainly a very strong sense of Latvian identity now. Some would say that Latvians are the only true descendants of the ancient Baltic tribes, as the Estonians have many Finnish connections and the Lithuanians have many Polish connections. So what is it that identifies a Latvian? To me it appears to be a passionate defense of some of those old and some new traditions. Since independence from Russia in 1990 the population has seen a dramatic decline from approximately 2.75 m to a little under 2 m today. This is obviously a decline which is unsustainable and might lead one to conclude that traditions are likely to be under threat as it would appear it is mainly the educated youth and the middle classes who are leaving. However recent visits to Folkklubs Ala Pagrabs served to reassure me that Latvia’s traditional music, song and dance is in safe hands. For those who have never visited Folkklubs, it is a place to enjoy traditional Latvian food and drink whilst being entertained in a traditional manner in very atmospheric surroundings. Whilst not having to pay a fortune. What I have noticed in my visits there is that most of the entertaining ,particularly the dancing, is performed by young people. By young I mean under 30. I subsequently found out that there are waiting list for young school children to join many of the traditional dancing classes in and around Riga. Now this got me thinking back to the UK. 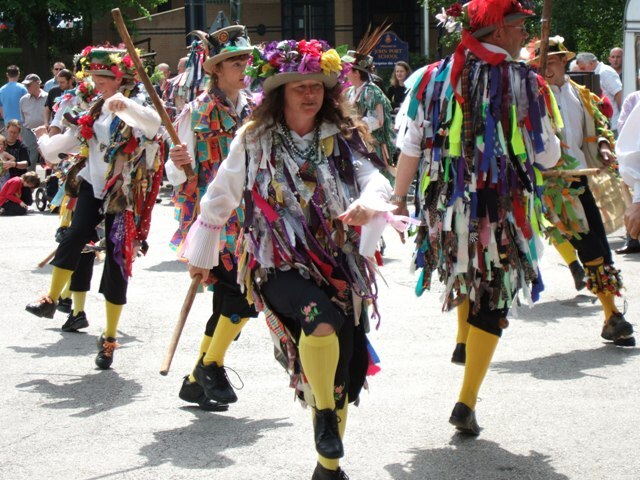 Yes we do have traditional dancing troupes known as Morris Dancers. (Click here to have a look at a video). There is however a big but here. In the 61 years of my life I have never met any one who was a Morris Dancer and in my youth it was considered a very “uncool” pastime and looked upon very negatively. I’m not really sure why this was the case and if this attitude stiff persists today. Is it because we have lost a sense of what it means to be British? I don’t know? On Sundays around Latvia, in fact all days but mainly Sundays. you might observe dozens of people heading in the same direction with buckets, spades, rakes and watering cans in hand. One might be tempted to assume that they were on their way to their allotments (vegetable garden) but oh no they are in fact going to the cemetery to tend the graves of their departed loved ones. For some people this is a weekly visit. Perhaps even more frequently. I don’t know if this is an old or new tradition but due to the unusually beautiful setting of these cemeteries it is a visit I am happy to make when accompanying Inta to clean and tidy her parent’s grave. I’m not sure if it is appropriate to call a cemetery beautiful? If it was a park it definitely would be described as beautiful. Why do people do this on a very regular basis. I think a common reason would be out of a sense of duty or respect coupled with the opportunity to spend time in a beautiful place in quiet contemplation of the past, the present and the future. This entry was posted in Culture, Latvia, Latvian music and tagged Latvians dance music cemetery. Bookmark the permalink. 6 Responses to Latvian Identity – what is it? Another excellent post. I have truly enjoyed all of your posts which have been a real treasure trove of information for me. Looking forward to meeting up sometime now we are ensconced in Sigulda. There’s something so beautiful in people tending graves and enjoying showing respect! It seems from some of my reading that some Barons and ‘Germans’ started the movement, researching traditional songs, teaching people to sing, doing archaeology, etcetera. Many were keenly interested in the history of Livonia, some being descendants of the Livians ‘Libiesi’ and many none aristocratic Livians chose to be ‘German’ to the point where they disappear as a group in historical texts. However that is not a popular view, well to do Latvians took exception to being called Bauri (peasant) understandably! For example Krogzemis ‘Auseklis’. By creating song festivals and other activities a notion of nation became popular to some, and the stories and history that some were learning in schools set up by some of the Barons gave them a sense of identity and the ability to further themselves in whichever way they saw fit. The ending of ‘Slavery’ in the 19th century also will have helped! As for the decline, I personally know many who have returned to Latvia and seem to be doing very well, I see many derelict properties being renovated and new businesses opening, I think and hope that the tide is turning. This is something I would like to see happening and I think encouraging the stories to emerge will help that by bringing that sense of identity to a place. I think many do want to return but only if the conditions and their finances allow. There is so much talk about what is needed for people to return, but I wonder if the authorities are ready for that. These people will not return and just slot straight back in in the way that some will want them to, they have changed and will expect changes in the regions to reflect that. Not sure if that is all a bit vague, but the way forward will be a mix of the traditional and the new and deciding what to keep and what to throw out will make the times interesting.